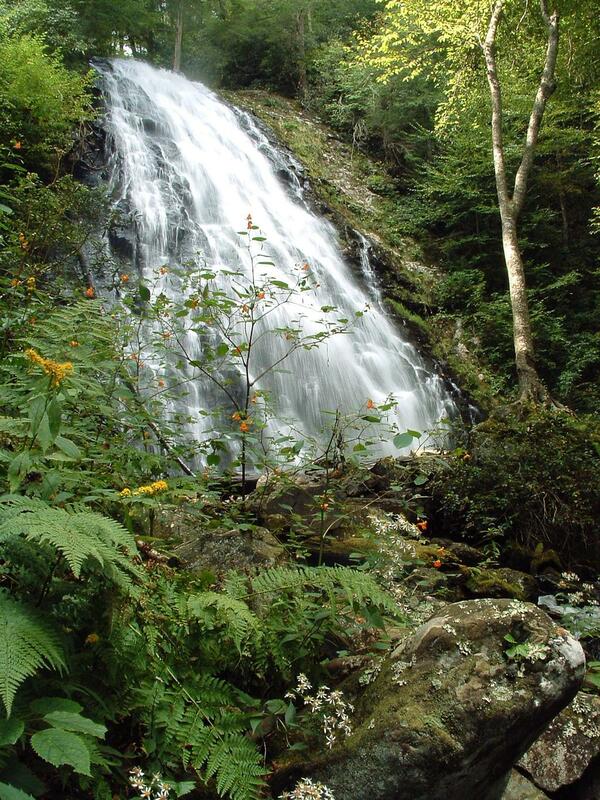 Crabtree Falls is one of the most distinctive, recognizable and photogenic waterfalls in the region. It starts out as a narrow cascade but fans out evenly over a steep rock face with countless smaller ledges, cracks, and outcrops before spraying into the pool at the base. Large boulders litter the stream below the pool and one supports a picturesque birch tree, with its visible roots spreading out over a small clump of soil on the top. Other trees surrounding the falls turn bright yellow and orange in the fall. If you have time to hike to just one waterfall in the area, this may be it. Highly recommended. The Crabtree Falls Campground road is located at milepost 339.5 on the Blue Ridge Parkway, about 8 1/2 miles South of NC Hwy 226 in Little Switzerland, NC, or just under 5 miles North of NC Hwy. 80. It's about a 21 mile drive from Marion, NC via NC 80. Go 0.3 mi on the campground road; the Hiker Parking area is on the right, just before the campground itself. If the campground road is closed, park at the visitor center instead and take the 1/4 mi. connector trail to reach the hiker parking area. If the campground road is closed, take the 1/4 mi. connector trail from the visitor center parking area past the amphitheater and through the meadows to the campground. Bear right at the split to reach the Hiker Parking area. All trail intersections are signed. From the Hiker Parking area, the northeast half of the loop trail is the quickest way to the falls. It descends the whole way - it's steep and rocky in a few spots, but not too bad overall. It's 0.2 mi from the parking area to the loop portion; turn right. It's 0.7 mi further to the falls. You may either return via the same route, or, to complete the loop, continue past the falls and up the other side (2.5 mi total plus 1/2 mile if you're parked at the visitor center).